Sting has announced ‘My Songs’, a new album comprised of the 17-time Grammy Award winner’s most celebrated hits from his unparalleled career, each reshaped and reimagined for 2019. ‘My Songs’ will be released on 24 May in multiple formats including a deluxe edition featuring bonus content (see below for track listings). 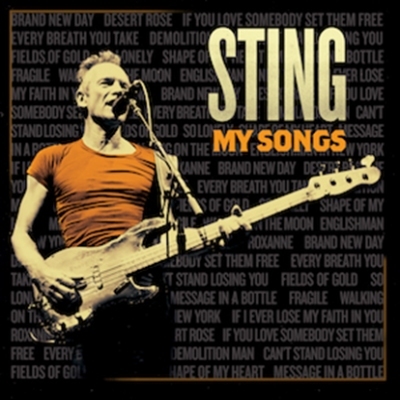 ‘My Songs’ boasts modernized recordings, faithful to the original arrangements and celebrates Sting’s illustrious musical career as one of the world’s most distinctive and influential artists. Since forming The Police in 1977 with Stewart Copeland and Andy Summers, Sting has evolved into one of the world’s most iconic artists, selling 100 million records and earning the highest accolades along the way. Fans can expect to hear Sting’s own fresh approach to hits including “Englishman In New York,” “Fields Of Gold,” “Shape Of My Heart,” “Every Breath You Take,” “Roxanne,” “Message In A Bottle” and many more. Never one to stand still, in the summer of 2018, following his collaborative album release with Shaggy - the Grammy Award-winning chart-topping record ‘44/876’ – the iconic duo launched a world tour through North America, South America, Eastern Europe and this year will extend to the UK for a series of intimate shows from May 19th - 25th. These collaborative performances will be followed by Sting’s own, solo ‘My Songs’ tour this summer - a dynamic show featuring the most beloved songs written by Sting spanning his prolific career, accompanied by an electric, rock ensemble. Tour itinerary and tickets can be found at www.sting.com. ‘My Songs’ was produced and A&R’d by Martin Kierszenbaum (Sting, Lady Gaga, Robyn), Dave Audé (Bruno Mars, Selena Gomez) and Jerry Fuentes (The Last Bandoleros). The album was mixed by Robert Orton (Lana Del Rey, Mumford & Sons) and engineered by Tony Lake (Sting, Shaggy). ‘My Songs’ will be released on CD and vinyl, and a deluxe edition will be available including live recordings of ‘Synchronicity II’, ‘Next To You’, ‘Spirits In the Material World’ and ‘Fragile’. An exclusive edition for Japan will also feature a live recording of ‘I Can’t Stop Thinking About You’, and an exclusive for France is set to include an extended version of ‘Desert Rose’.